Agree 100% with both Sepia and Laffite about this thoroughly enjoyable, wonderfully addictive, family movie. It is one of those that I never tire watching again and again. Would have loved to have seen the original stage play, but I cannot imagine a better cast than the 1947 film adaptation. And wasn't teeny Liz just so delightful to watch? It was this movie that inspired me to read the book (and other reflective writings) by Clarence Day Jr. Thanks Lawrence and Tom for bringing up SWAMP WATER (1941) directed by Jean Renoir and based on the 1941 novel by Vereen Bell. Love watching (re-watching) that movie as well. Something about the atmosphere and rural dynamics strikes a folksy chord with me and I find myself thinking about my grandparents. Dana Andrews accent (as that of Gary Cooper in Sergeant York) are so authentic, and their acting so sincere, it makes the characters all the more believable. Same with the always great (on screen) personas of Walter Brennan. There was a later remake by a different title, which also featured Walter Brennan in the same role and a young Jeffrey Hunter playing the part that Andrews portrayed. I liked that one too, but only 'cause it makes me think about the original film which is priceless. 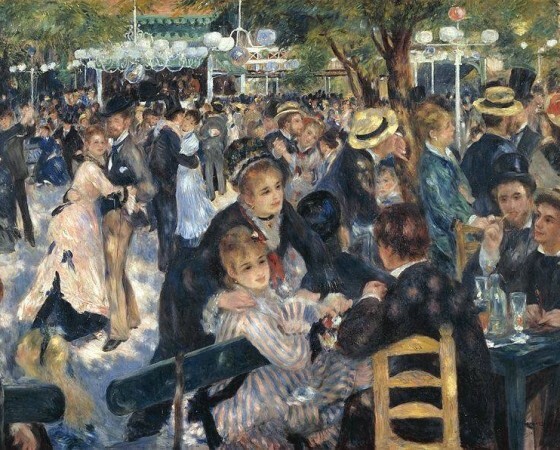 Jean Renoir, the name sounds like that of a French Master Painter doesn't it? Well, IMO he was no less a master artist when it came to "painting pictures" in cinema. I've yet to see one of his films that I did not appreciate and enjoy. Along the "simple country folk" lines of Swamp Water, is another (under appreciated) film by Jean Renoir THE SOUTHERNER (1945). A family film which realistically depicts the rustic lifestyle and hardships of a simple farmer and his family trying to make a living in the south. I thought this was actor Zachary Scott's finest (and most endearing) performance. Like Andrews in Swamp Water, he was believably authentic and sincere in the role. And the supporting cast was equally wonderful. Betty Field as the "rock solid" wife, Beulah Bondi (forever cast in roles beyond her age) as the insufferable granny, J. Carrol Naish as the begrudging neighbor, Norman Lloyd as the jealous hand, and Charles Kemper as the faithful friend from the "city"... the entire cast seemed made to order. This film was so authentic in its depiction, one can almost taste that possum stew! TEXAS (1941), as Lawrence stated, is nothing really special as far as westerns go. But I enjoy it to catch an early screen appearance of two of my favorites at their most attractive best, William Holden and Glenn Ford. It's good to see Texas if only to contrast how far these two young actors were able to go with their respective acting careers. Also enjoy seeing affable Edgar Buchanan in his pre Petticoat Junction days as a deceitful heavy and bad guy. Now I've got a yen to dig into my "collection" and re-watch all of these movies. Thanks guys! Jean Renoir the name sounds like that of a French Master Painter doesn't it? 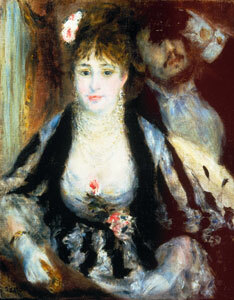 The film director Renoir was the son of the famous painter Pierre-Auguste Renoir. You do realize the painter was his father? Damn Lawrence A's nimble fingers! Yes, I did. But only after I became fascinated by the movies I saw by his director son as a kid. When I later developed an appreciation for art I discovered the connection. The question I posed was rhetorical. But I am glad that it elicited such erudite responses. 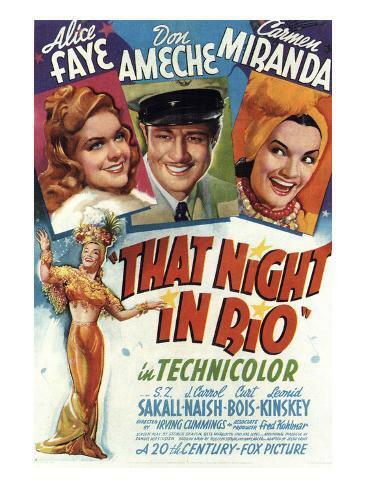 That Night in Rio (1941) - Technicolor musical romance from 20th Century-Fox and director Irving Cummings. American Larry Martin (Don Ameche) is a performer in a nightclub in Rio de Janeiro. Part of his act involves an impersonation of local dignitary Baron Duarte (also Ameche). When the real Baron has some financial difficulties, his advisers convince Larry to impersonate Duarte until things can get straightened out. Complications ensue when the Baron's wife, Baroness Duarte (Alice Faye), falls in love with Larry-as-Baron, much to the annoyance of Larry's nightclub partner Carmen (Carmen Miranda). Also featuring S.Z. Sakall, J. Carrol Naish, Leonid Kinskey, Curt Bois, Frank Puglia, and Maria Montez. Source: Fox DVD. There's a featurette on Faye's post-movie star life, and a deleted scene. Inspite of a title which sounds like something for a horror film and the second billing of Lionel Atwill, this Universal programmer is a breezy "mystery" (not a lot of mystery here) which opens with a series of murders committed of men found innocent of a crime by a killer who leaves notes nearby signed, you guessed it, Doctor Rx. Patric Knowles plays a dapper detective who lives in a beautiful penthouse apartment with a servant. Don't they all? He spends much of his time looking suave and bantering, with the servant (Manton Moreland), his girlfriend (Anne Gwynne) or a hard nosed police captain (Edmund MacDonald) who wants him to work on the Dr. Rx case because, well, he's hopeless to solve it on his own. Lionel Atwill, prominently displayed in posters advertising the film and wearing coke bottle bottom glasses, also pops up on the rare occasion, as a suspect. But he's barely in this 65 minute feature. There is, for those who enjoy it, a lot more in the way of clowning from Mantan Moreland and Shemp Howard, the latter playing a police detective who, at one moment, plays craps with Moreland then arrests him for illegal gambling. As the film is winding down suddenly, out of no where and seemingly from another film, there is a ten minute sequence involving a caged ape straight out of a mad scientist horror film. It's a fun over-the-top piece of stereotypical melodrama, certainly enjoyable while it lasts, but the viewer has to wonder, "Why didn't we get this kind of stuff in the first 50 minutes of this film?" For those who enjoy Universal "B"s this is a minor effort, but they will still probably get a kick out of some of it, certainly the horror portion, brief as it is, towards the end. 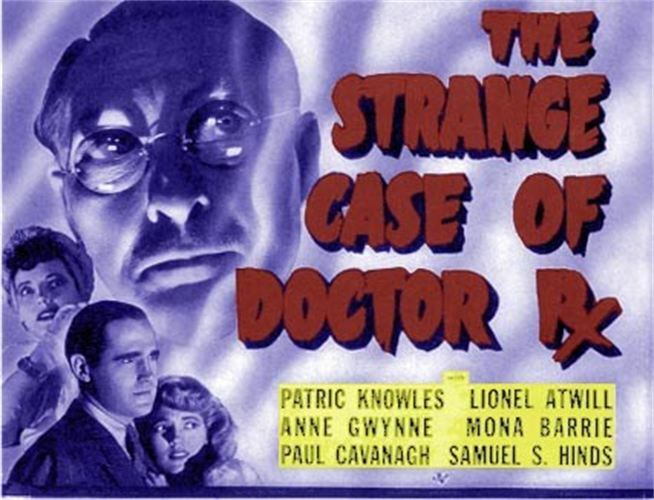 A pretty good looking copy of The Strange Case of Doctor Rx can be found on You Tube. Doctor X (1932) from Warner Bros. with this Doctor Rx one made in 1942 from Universal. They both starred Lionel Atwill but I couldn't place former "Stooge" brother Shemp Howard, so I looked it up and realized my mistake. Yeh, Stephen, two entirely differing films despite the similarity of their titles. I'm a big fan of films in which Fay Wray screams, Lee Tracy fast talks and Lionel Atwill is creepy. Needless to say, I love Doctor X.
I love the scene where Irene Dunne explains how exchanging the pug dog for a suit doesn't cost any money. Ha! Yeah, both Vinnie and my wife have the same economic sense. I also like how after being given the $5 to buy a new coffee pot, she charges the new one instead, and since the one she charged only cost $4, she insists HE owes HER a dollar! Thieves Fall Out (1941) - B-movie comedy from Warner Brothers and director Ray Enright. Eddie (Eddie Albert) and Mary (Joan Leslie) elope, upsetting their respective fathers who are business rivals. Eddie struggles to get started in business himself, but his grandmother (Jane Darwell) convinces him to sell his inheritance to a broker for quick cash. Unfortunately, the broker is also in league with some gangsters. Also featuring Alan Hale, John Litel, William T. Orr, Anthony Quinn, Frank Faylen, Hobart Cavanaugh, Minna Gombell, Edward Brophy, and Etta McDaniel. (Texas 1941) The best performance in the movie, to my mind, is from Buchanan as an amiable dentist. He may be amiable but that won't help if you need a tooth pulled. If I remember correctly, he performs a dental procedure that might qualify as a scene in a horror movie. William Holden is so young in this movie he is hardly recognizable. I like pleasant time wasting. Miss Leslie is such a charmer, it would be nice to see her in such an early film. And, as you point out, Miss Darwell is an attraction. Nothing on NetFlix nor youtube. Out in the cold. Week-End in Havana (1941) - More Latin-flavored Technicolor musical shenanigans from 20th Century-Fox and director Walter Lang. When a cruise ship headed to Cuba runs aground, the company boss sends his vice president Jay Williams (John Payne) down to smooth over things with the irate passengers. They all sign waivers absolving the cruise line, except for one passenger, Macy's shopgirl Nan Spencer (Alice Faye), who resents losing out on her long-planned vacation. Jay agrees to accompany her to Cuba to oversee a proper vacation on the cruise line's dime as long as she'll sign the waiver at the end of her trip. They run into various problems, including getting tangled up with suave Monte Blanca (Cesar Romero) and nightclub singer Rosita Rivas (Carmen Miranda). Also featuring Leonid Kinskey, George Barbier, Cobina Wright, Billy Gilbert, Chris-Pin Martin, Hugh Beaumont, and Sheldon Leonard. I do too, as well as Smiles of a Summer Night, Through a Glass Darkly, Winter Light (what a laff riot! ), Cries & Whispers, Persona, The Virgin Spring, Shame, and Wild Strawberries. I've also seen Fanny & Alexander, Autumn Sonata, The Silence, Hour of the Wolf, Face to Face, and Scenes from a Marriage. Lawrence, we're pretty much in agreement about which Bergman films we like. Face to Face is really goshawful, and after the opening scene (and the exit of Bibi Andersson), Scenes from a Marriage is almost as bad as Cassavetes. I'd switch Winter Light and The Silence, but that's a minor detail. I have yet to see Fanny and Alexander. Recommended for you: Summer with Monika, if only for the young and occasionally naked Harriet Andersson, and Sawdust and Tinsel (The Naked Night), one of Bergman's very best. Harriet Andersson and several other actors give superb performances. Great script and great direction. That's one of the top two or three Bergmans, for my taste. When Ladies Meet (1941) - Romantic comedy-drama from MGM and director Robert Z. Leonard. Successful author Mary Howard (Joan Crawford) is being romantically pursued by Jimmy Lee (Robert Taylor). However, Mary is infatuated with her new publisher, the suave and sophisticated Rogers Woodruff (Herbert Marshall), despite the fact that Rogers is already married to Claire (Greer Garson). So Jimmy decides to recruit Claire to unwittingly help win back Mary's affections. Also featuring Spring Byington, Rafael Storm, Mona Barrie, and Max Willenz. I've mentioned before that I find Robert Taylor to be one of the least impressive leading men of the Golden Age, but I found him a tiny bit more charming than usual here. But what about Robert Taylor during the '50s after his features had hardened and he was playing tougher, more macho roles? I have come to rather like him in some of his later parts, Lawrence. Have you seen him in either of a pair of westerns, Westward The Women (1951) or The Last Hunt (1956)? He's very effective in both, especially the latter film in which he is cast against type playing a fast draw cold blooded killer who hates Indians. This is probably the best performance I have seen him give. There was also the tough Taylor of a crime drama like Rogue Cop (again, very convincing) or the Taylor of his knights-in-armour epics, Ivanhoe and Quentin Durward. Yes, he remained a limited actor and a bit wooden but I think he convincingly performed in a number of different action genres, and should be commended for that. The Last Hunt. If there's only one Taylor performance to see for the first time, this is the one, for my money. As many of us grew up first knowing of Taylor from his TV show THE DETECTIVES, any movies he made before then and after are worth taking a look at. The first movie of his I ever saw was BATAAN, and was when I, along probably with many other "boomers" learned of his earlier film career. For my generation, TV was where we first were exposed and became familiar with many "classic" movie stars. Like ROBERT YOUNG("Father Knows Best"), WARD BOND("Wagon Train"), JOHN FORSYTHE("Bachelor Father"), WALTER BRENNAN( "The Real McCoys") and several others. So not a lot, and not many of the ones you mention. My antipathy for him stems mainly from The Gorgeous Hussy and Camille, and the trifecta of Quo Vadis, Ivanhoe, and Knights of the Round Table. I'll try to catch the others you mention when they become available. Lawrence, let me add Devil's Doorway to the list of better Robert Taylor performances. It's a solid film, very well directed by Anthony Mann. Granted, Taylor isn't ideal casting as a Native American war hero who fights for the rights of his people, but he does a capable job. Your list of Taylor films is definitely not one to make a lot of Robert Taylor fans these days. I think he's pretty good in Johnny Eager, but Van Heflin does steal the picture. A few years ago, when filmlover was doing a series of day-by-day 1939 posts from contemporary newspapers, he included a surprisingly snarky review from a Minneapolis paper about how MGM's "defeminization" (the reviewer's word) of Robert Taylor by casting him in action films. My wife and I watched The Stranger on the Third Floor on Sunday. Many (including Eddie Muller) considered this the first Film Noir. We both really enjoyed it. I've been a fan of Noir for years and I'm bringing my wife on board. I cannot believe I hadn't seen or even heard of this film before now. While I don't consider it to be on the level of The Maltese Falcon or Double Indemnity, it does have all of the characteristics we've come to expect from this genre. I'm looking forward to seeing more hidden treasures on Noir Alley in the coming days. I see that your list of Taylor films seen is missing Waterloo Bridge (1940). This is a beautifully mounted MGM soaper, with a luminous performance by Vivien Leigh and a pretty good one from Taylor. Taylor, by the way, called Waterloo Bridge the favourite film of his career. I mentioned just two of Taylor's knights-in-armor films because I think the third, Knights of the Round Table, is a dull dud. I gather you didn't care for Ivanhoe, though, Lawrence. I think Taylor's stolid presence works well in it. I know your expectations will be low but you might give Quentin Durward a try. It has a bit more in the way of humour (jokey references to the cheapness of Scotsmen) than his two earlier knights in armor efforts and I particularly like its climactic duel in a burning tower with Taylor holding onto a rope in one hand while swinging a sword at his opponent with the other. Kingrat had a solid suggestion in making reference to Devil's Doorway, an above average western I had overlooked. Thanks kingrat. I've read that Taylor sought out tougher, more macho roles in his '50s films to fight underground stories about his sexuality. Poor guy, whether in the closet or, especially, if he was straight as an arrow and didn't know any other way to fight false rumours. A sensitive young Jewish atheist introvert reflects on the series of events that lead to his dying during the Korean War. His relationships with his family, and with a beautiful but disturbed and fragile WASP girl. And losing his college deferment that ultimately makes him eligible for the draft. This rather serious bittersweet romdram had few moments of levity but managed to hold my attention throughout. The plot premise is that life is full of twists and turns and assorted forks in the road, involving numerous little choices that can have life altering decisive impacts. Though I liked this film I realize that it is Not for everyone. Written, produced, and directed by James Schamus, making his feature directorial debut, and based on Philip Roth's 2008 novel of the same name. I included this in my listing of Noteworthy Films from 2016. The performances were first-rate, and I still think about this film. It beautifully captured the 1950s. And the story involved so many elements: love, mental illness, youth alienation, conformity, religion and philosophy.